New research from Western University has identified a potential new target for the treatment of melanoma, the deadliest of all skin cancers. 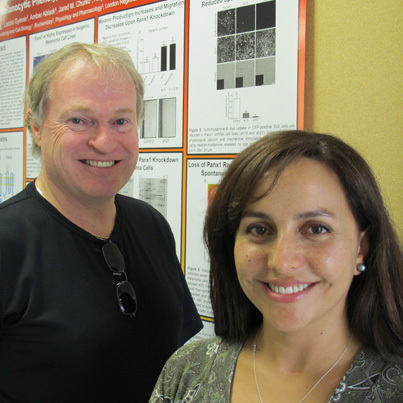 Silvia Penuela and Dale Laird discovered a new channel-forming protein called Pannexin (Panx1) that is expressed in normal levels on the surface of healthy skin cells. But they found, in melanoma, Panx1 is over-produced to a pathological level. The researchers also discovered that if you reduce it or knock it down, the cell becomes more normal. The research is published in the August 17th issue of the Journal of Biological Chemistry. Malignant melanoma only accounts for four per cent of all skin cancers and yet, it's responsible for 79% of skin cancer-related deaths. The World Health Organization says there are 200-thousand cases of melanoma diagnosed each year and 65 thousand melanoma-related deaths (2000 statistics). "We think this over-production of Panx1, enables the melanoma to become very aggressive. The cells have these extra Panx1 channels and they can leave the primary tumor and invade other tissues," explains Laird, a Professor in the Department of Anatomy and Cell Biology, and Canada Research Chair in Gap Junctions and Disease. "And when you find a protein that is highly up-regulated in a disease cell such as a melanoma, the question becomes, is there therapeutic value in targeting a drug to that protein to reduce its production or block its function. Would that be an effective treatment?" "We now want to correlate our discovery to patient samples using the human melanoma bank through our collaboration with Dr. Muriel Brackstone and other clinicians at the London Health Sciences Centre, to see if this is a cancer marker," says Penuela, a Postdoctoral Fellow working in the Laird lab. "So if a melanoma lesion has a lot of this protein, it might be a tool for prognosis, in saying this is more advanced, or going to be highly metastatic. And because it's on the skin, it would be more accessible for treatment." Penuela suggests potential treatment might be in the form of a topical medication to use on melanoma lesions. The scientists also worked with David Litchfield and John Lewis and their teams at Schulich Medicine & Dentistry and the London Regional Cancer Program on this research. It was funded through the Canadian Institutes of Health Research. The Laird laboratory recently received a $200,000 Innovation Grant from the Canadian Cancer Society Research Institute to further its studies on Panx1.